Reading wilderness maps and understanding basic land navigation skills is crucial to being able to survive in any wilderness environment. You should always take a wilderness plan with you every time you go hiking, camping, or backpacking. A topography map is the best type of chart. Don't rely on that old highway map in the glove box of your vehicle. It won't help you much if you get lost in the wild with no roads. Wilderness road maps are one of the most important items you should have in your backpack, so you want to make sure you have one before you embark upon your journey. Don't assume that you will come across one on the way into the wilderness because this is often not the case. There are many online sources where you can find accurate and reliable wilderness road charts. REI - REI is one of the premier camping and hiking supply companies in the world. They provide topography maps and the best camping and hiking equipment. Trails.com - Trails.com has become one of the most reliable resources for wilderness maps. The site features biking and hiking trails across the United States and Canada, featuring more than 30,000 detailed trails and free USGS topography maps of the entire United States. Real time trail reports and weather is also available for free. Trails Illustrated - Trails Illustrated is a byproduct of National Geographic and provides an exceptional selection of trail guides covering the entire United States with extensive trails in the US. Topography maps are based upon information obtained from geological surveys. They display the shape of the earth's surface by contour lines. These contour lines serve as imaginary lines that connect points of equal elevation on the surface of the earth above a reference surface, such as sea level. Using contours makes it easy to measure the elevation difference in the wilderness. With contours, we can measure the depths below the surface of the ocean, the altitude of the mountains, and the steepness of the area, known as elevation gain. Just as street maps have symbols denoting different types of roads and information, topography charts also include symbols that represent different features. Understanding how to read the symbols will enable you to understand the wilderness around you. Both natural and manmade features will be displayed on the contour map. This means that just as mountains and rivers will be depicted, so will houses and other manmade structures. Each map is different so it is very important to look at the layout before you enter the wilderness and understand exactly what each symbol stands for. Trails Illustrated in a byproduct of National Geographic, and provides an exceptional selection of trail guides covering the entire United States with extensive trails in the US. Circles and closed loops usually denote uphill on the inside and downhill on the outside. The innermost loop is the highest point in the area. Sometimes loops represent a depression instead, and most maps note this by using the short lines coming from the inside of the loop, known as hachures. Sharp pointed V's usually are in stream valleys, with the drainage channel passing through the V point, and the V pointing upstream. This is the result of erosion. Contours close together indicate a steep slope, while distant contours depict a shallow slope. Two or more contour lines merging indicate a cliff. 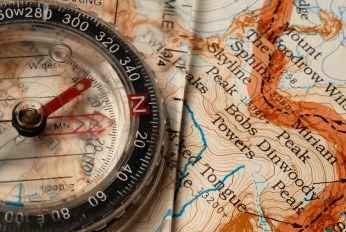 A wilderness road map is an essential component to basic camping and hiking gear. It is perhaps the single most important item, and it is never advised to enter the wilderness without a plan or guide, regardless of how well you think you know the area. It's always better to be safe, whether you're planning an easy day hike near your home or embarking upon a courageous Alaska adventure hiking experience. Topography maps are the most widely used type of wilderness navigation key because they depict the change in elevation and use contour lines to show where the elevation remains the same. Always look at your plan before entering the wild, rather than trying to figure it out for the first time if you get lost. After all, it's fun to hear adventurous tales of camping and hiking experiences, but real survival stories in the wilderness are usually better left to somebody else.